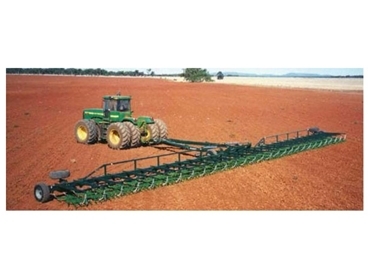 The 2581 SJ Hydraulic Harrow Bars from K-Line Industries harrow and rake trash on large broad acre farming properties. These rugged and reliable hydraulic harrow bars consist of induction hardened pins, an extra heavy duty frame construction and 2.5T axles which are designed for harsh field conditions. The cables fold automatically for safety and the harrows just need to be lifted and driven forward for transport. The wings will trail behind. When preparing for work this is the reverse and so the wings should spread 180 degrees and then lower to a working position. Safety pins are provided for transport means.